The Space Race is on at the Nixon Library on July 20th, 2019. This race is a celebration of the 50th anniversary of the Apollo 11 moon landing and the kick off to a day of family fun. Racers are encouraged to dress in their best spacesuits -- or any other out of this world costume! -- for this race which will follow a moderate course that is accessible for runners of all levels. Strollers welcome! HUGE VALUE! Registration includes bibs, timing, commemorative race shirt, and an exclusive 3D Apollo 11 themed medal. Registration cost also includes entry to the all-day festival to follow, featuring live entertainment, games and prizes, giveaways, face-painting and balloon art, food trucks, and more! Sign up today to save your spot for a 5k of intergalactic proportions. Early bird pricing is ending soon! Lift off is at 8AM! 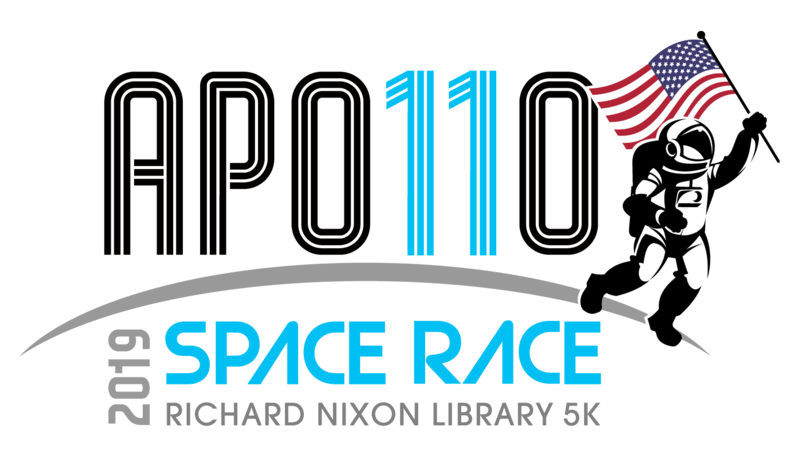 This race will blast-off and splash down at the Richard Nixon Presidential Library. Costumes are encouraged but not required. Children 4 years and under are invited to participate at no cost, however they will NOT receive a bib, timing, shirt, or medal.